I had purchased a baguette for something, I can’t remember what and I didn’t end up using it. The baguette sat on the counter making me feel guilty for days. I hate wasting food and needed a plan. I found a recipe for this Spicy Moroccan Bread Salad and it turned out to be a real treat. The cumin-scented bread with the Jarlsberg cheese was the perfect complement. This salad was my lunch for several days and it never got soggy. I loved it and is a great take on bread salad in general. This would also be perfect with a meal. Don’t wait to make this, have it tonight. 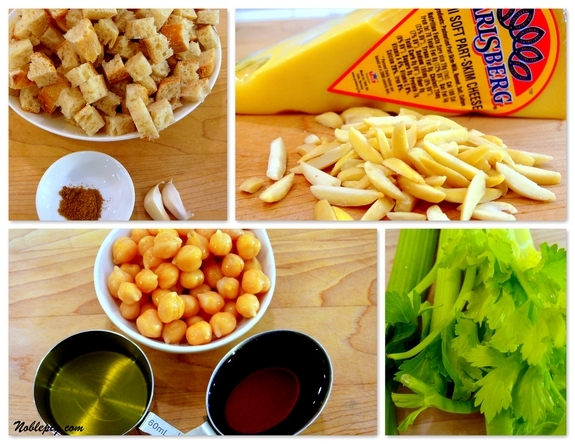 Here’s what you will need: Extra-virgin olive oil, garlic, baguette, celery, chickpeas, Jarlsberg cheese, slivered almonds, red wine vinegar, salt and pepper. 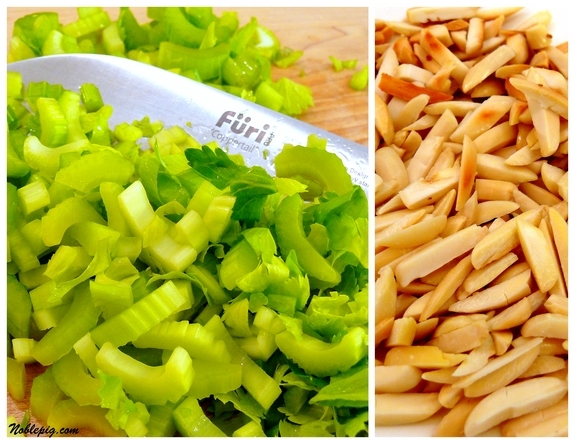 Prepare your celery by slicing the ribs along with the leaves into bite-sized pieces and toast your almonds. In a large bowl combine 1/4 cup extra-virgin olive oil, 1 teaspoon ground cumin and 2 cloves crushed garlic. Add the cubed bread and toss. Season with salt and pepper. Scatter on a baking sheet and bake in a 350 degree oven, tossing occasionally until toasted. 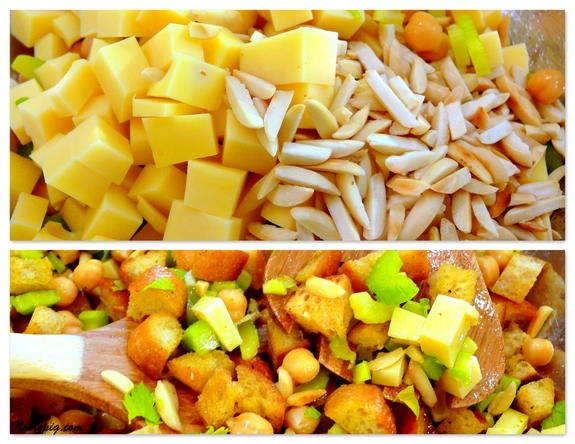 In the same bowl, mix the celery, chickpeas, Jarlsberg, almonds, vinegar and remaining 1/4 cup olive oil. Add the bread and toss. Let stand for at least one hour. Season with salt and pepper. If you want to add some sweetness, golden raisins would be a good choice. Otherwise, enjoy it just as it is. One Year Ago Today: What Would Seinfeld Do? Just curious … does “spicy” just refer to the cumin or was there an ingredient like cayenne or something that was left out? When I see the word spicy in a title, I tend to think a hot kind of spicy. Maybe Smoky Moroccan Bread Salad would be a better description since the cumin is more smoky than spicy? Salad looks yummy and so do your tarts! Mmm! Hey, you’re going to have to change your profile description soon! What fun! Now that’s my kind of salad! I can just taste the toastiness of the almonds and the croutons, together with the vinaigrette and the crunchy celery. I suppose the seagulls will have to do without their stale bread for a day so I can have my salad! Thanks! you gotta love when you find a use for day old bread. Mine usually goes to feeing the ducks!! Looks yummy except for the celery. Celery literally makes me gag. Would it do ok minus the celery? Would a 5 day old baguette work? I think I would need a saw though. Love all the flavors in this one! Love the raspberry lemon tarts! I am about to make some sweet pastry this morning so that I can make tarts for our Church Tea Room. Anything with chickpeas works for me. This is a thing of beauty! The colors are wonderful and the ingredients combine to make a very flavorful dish. I like this one a lot. Wow…sorta like stuffing for summer. Definitely a keeper. SO going to be making this one! Looks like my kind of salad! Yum! Interesting – I don’t think I would have ever, in a million years, thought of anything called a bread salad. Hmmm–it just so happens I have a few-day old baguette sitting on my counter! I might just give this a try! Seriously…when are you going to write your own cookbook? What a great idea for leftover bread. I usually end up making some kind of garlic bread for my son to avoid throwing it away. This is a great alternative. Oh, and the Tartlets look delicious. Bread salad is an awesome idea! My daughter would really love this! What an amazing salad, I love this type of food. I have a two day old baguette! This looks so good for a nice summer meal. I’ll have to try this one! I love it! It’s like a salad of croutons…hold the lettuce! This sounds so easy to make and it looks fabulous! I love how simple this is but so full of great textures and flavors. Looks delicious! I’m not a RR fan, but have to admit this looks very good and very easy. Please check out my current post–I gave you an award. This looks spectacular! I do hate to waste good bread and I really like chickpeas. I will be making this soon. Oooooh, support this fully! Bread salads are so comforting. There’s a great Jerusalem bread salad at this resto in LA, and it’s addictive. Yours looks like one to add to the summer list. This looks amazing! I can’t wait to try this this week… it would go perfect with summer gatherings! Looks great, but bread never lives even 24 hours in my house! Especially now, with most of the college folk home! This looks like a wonderful salad for a summer picnic celebrating your move to Oregon!What wine goes with this? P.S. We are almost finished with the bag of muffins from the freezer, the recipe from you awhile back. They are still delicious and I will have to make more for the freezer, after we eat the banana bread I baked using another of your recipes. What we like about your recipes is they are ‘do again’, thanks! I never heard of a bread salad! Ben would adore this! my goodness this does completely satisfy the “I want large chunks of bread and cheese in my salad” doesn’t it. Man, this looks so good. I’m snacking on popcorn as I read this and it is still making me hungry. Can’t wait to try this. Sounds simply delicious. I might try it tonight. Thanks, as always, yummy site. This does look delicious. I might try it tonight. Thanks, your site is always yummy. It’s a season for more salads! Looks so good but I’ll leave out the celery.. The bread in that is gorgeous! That looks good! The only bread salad that I’ve ever had is a panzanella. I love the whole idea of this salad. All the different textures and flavors, just perfect! I love bread salad – this one looks especially good with all those chunks of cheese. I love this because it uses ingredients I often have on hand, including the cheese. There are so many wonderful variations of bread salad. You can even use day-old bread that you’ve stored in the freezer. oh my god, what a great way to use up old bread…I’ll buy bread to MAKE it old in order to enjoy this! and golden raisins in there sound real good…wonder about dried figs? YUM! nothing more is needed, but……. I needed another recipe for garbanzos. And lemon with raspberry is great. Hi Cathy .. great idea .. I have always loved the idea of rustic peasant salad .. fried bread pieces, salads, tomatoes, bacon pieces, chunks of cheddar .. delicious meal .. without much effort .. but the Moroccan twist .. I’ll definitely do ..
Man, I sure wish I could eat bread! This looks so good! I don’t hate Rachael Ray, but somewhere along the line I stopped caring about her. I don’t even think about her as a serious cook any more. Your questions made me stop and think about why. I think – three things: 1) she became too ubiquitous. She had multiple shows going at once. I figured, “why not? somebody must be watching all that.” But I stopped. 2) She absolutely had too many cutesy names. The first few were OK, but I got sick of it, and moved on. 3) She started thinking she was a sexpot. Again, fine for me if other people keep watching. I don’t care. And naturally every woman wants to be attractive. But if you push it, your credibility in other areas often diminishes. Oh this looks delish! I love every ingredient in this! Yum! What a cool idea! It’s Moroccan panzanella. I love the flavors in this. Great use of the old bread! Oh, this is genius! The only bread salad I’ve had before is the Italian panzanella version, which is love, but this looks like something I could eat regularly, too!Q YUM! This looks like a wonderful salad for warm summer evenings out on the deck. I think I even have a perfect bottle of wine to accompany it. Wow…have the stars aligned or something? Great use of the baguette! I never think to make bread salads, but the chickpeas, celery, and cumin sounds great in this one. Wow, never heard of bread salad…very interesting and tempting…love the colors and the ingredients in it. Great pictures! This time of year I am always looking for good simple quick meals and this also makes use of the what to do old bread. Maybe when I get to the baquette part in bread baker’s apprentice I will give this a shot. Nothing goes to waste AND it looks delicious! What a terrific idea. I’m always having to deal with days old bread, and this will be nice for the hot summer evenings. I can’t believe the yumminess you ALWAYS come up with…..YOU’RE THE BEST!